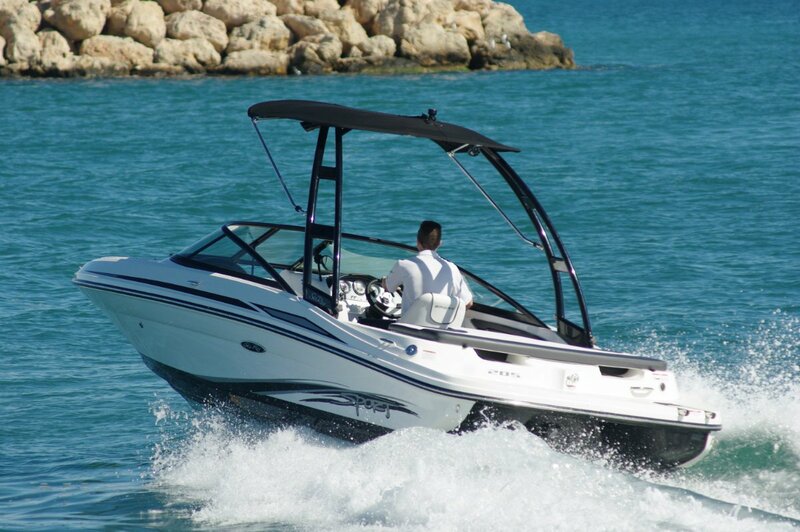 The Sea Ray 205 is what many would think of as the archetypical American boat: a sterndrive powered, thoroughly equipped bow rider, with an emphasis on getting numbers on board. 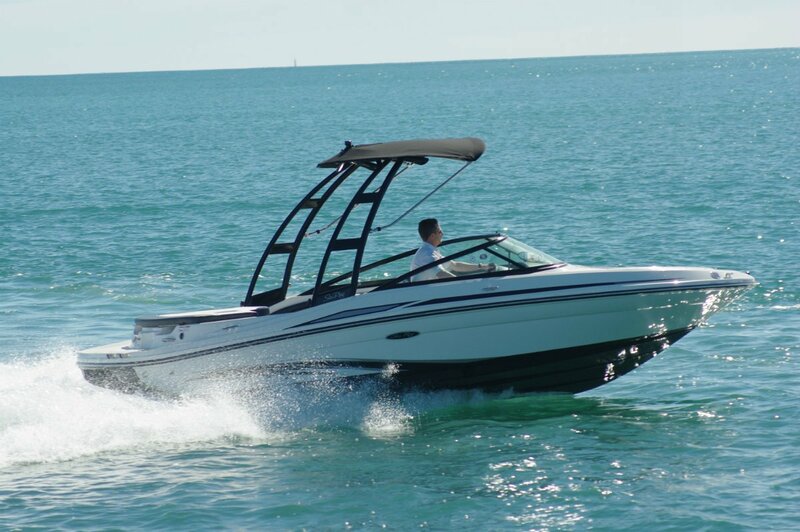 A difference is that this is not a boat confined to sheltered waters; calling it an all rounder would be a stretch, but plenty of activities are possible. We gave the 205 its head on the ocean. Not a lot of wave action, but at the speeds we were doing we still gave the hull something to think about. It is a hull with a little more offshore-style shape than typical, and the respectable deadrise of 19 degrees. 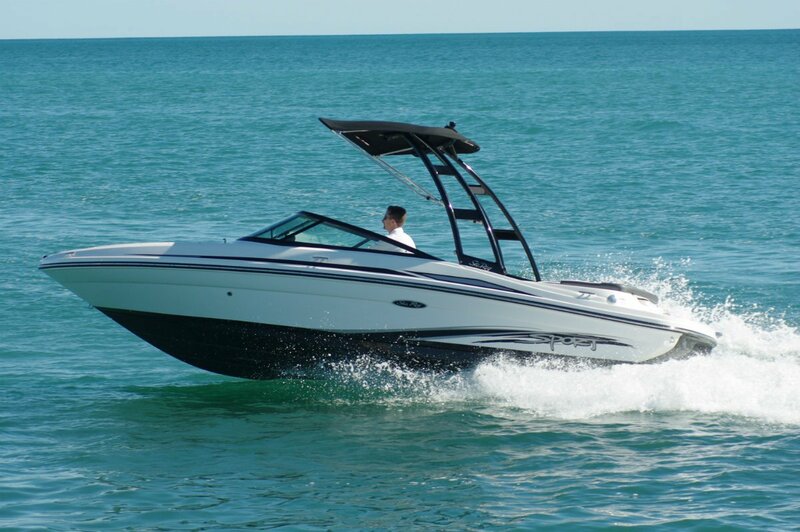 Our workout produced no rattles, and the seats combined with the hull to deliver a comfortable ride. Those seats are good, and the eight of them did not fill the boat as tightly as in the usual sterndrive layout. 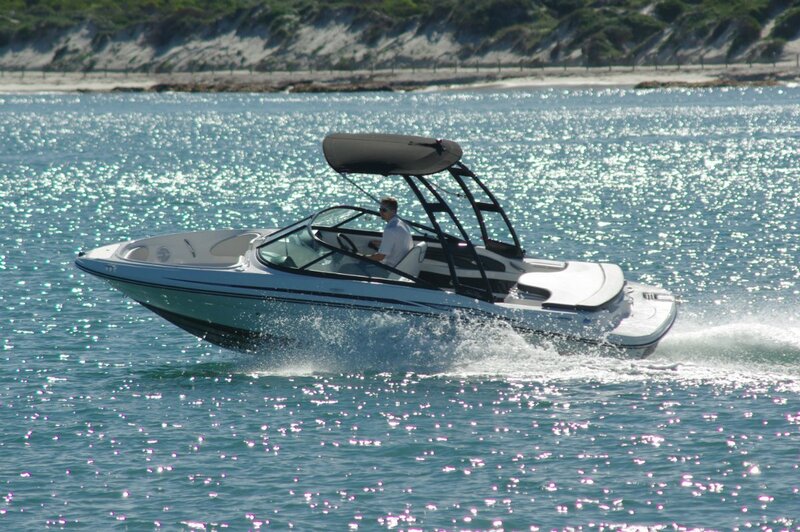 Instead of using the motor box top as a sun bed – largely unwanted in WA – a pair of seats is recessed within the box, and not afterthought quarter seats: they are of the same standard as the others, and that means you would be happy to spend the day in them. A day that could well include a trip to Rottnest or an extended cruise north inside the reef. The latter would certainly call for anchoring here and there for a swim, and US-built boats are usually poorly equipped for this. The Sea Ray does not have a bowsprit or cruciform bitts, but it does at least have a lidded anchor well with useful amounts of room in it. There is no built-in icebox for these trips, but within the dash a large lidded bin has an overboard drain and will do the job for a few cans. The forward cockpit has its seats better arranged than most and adults would be happy in them. If there are children on board the adults will not get a chance, and this is good: a great thing about bow riders is that children can be under your eye instead of behind you. Both cockpits are carpeted and feature plenty of padding, grab handles and drink holders. The coastal trips are likely to be less frequent than jaunts on the river. 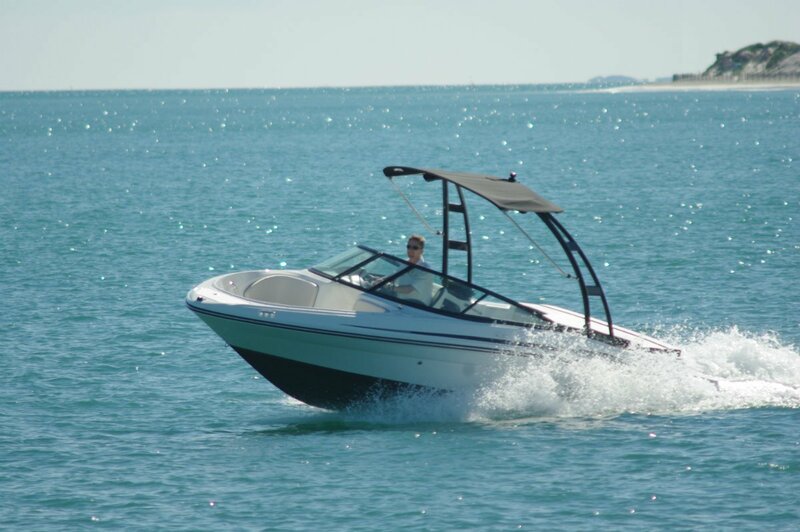 As well as being competent on the ocean, this is an upstream cruiser and ski boat fitted with an observer’s seat for the job and an under deck compartment for skis and wakeboards. The review boat came complete with a wake tower, although it has no ballasting or wake making tricks. Five litres of grunt from the Mercruiser would make the 205 popular with barely competent social skiers – launched and skiing instantly. The vital accompaniment to a skiing day is present – a Sony stereo with CD player and MP3 port. The standards of finish in the upholstery and fit-out are high, and the hardware is well up to its tasks. Thoughtful items include a superb catch for the opening windscreen and an adjustable steering column. Towing weight is a little over two tonnes, plus the stuff that always gets loaded of course, so nothing special is required in the tow vehicle. Like many dealers the Sea Ray agents are holding down costs by limiting the amount of stock on the floor, so actually getting a new one could take about three months.